This past Memorial Day weekend, I like millions of Americans, had a small BBQ gathering. 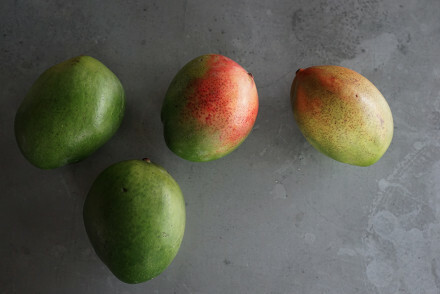 Many of my favorite BBQ staples were on the menu, as were mangoes. Mango BBQ pulled pork and brats were the main event on the grill, accentuated by some salads and drinks. As usual, I felt pressure to create something new, something unique, as I often do. I derive great joy from the creation process and thus the pressure is often subtle and soft. 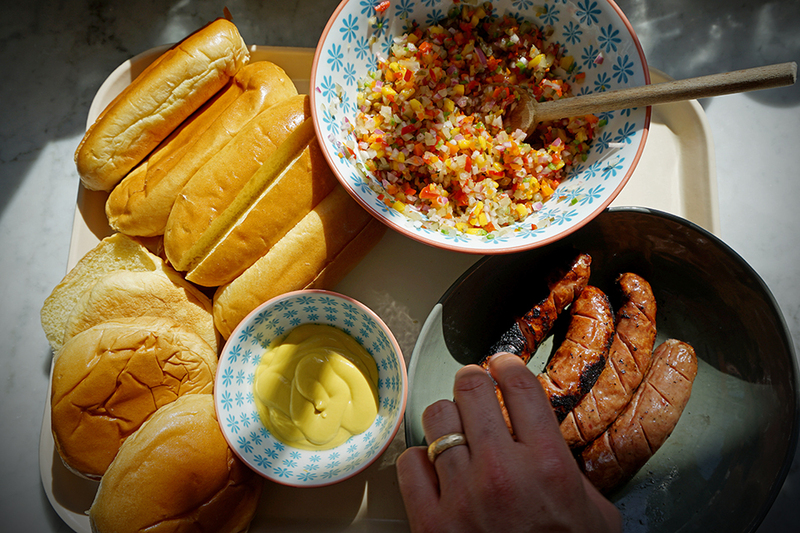 I tend to enjoy my “All American” style BBQ meals rather simple, burgers and brats and not much else. I tend to get creative on the condiment side of the equation. I like the challenge of making easy to prepare, tasty condiments ahead of time and so I am able to get the most amount of time in the sunshine with friends and family. 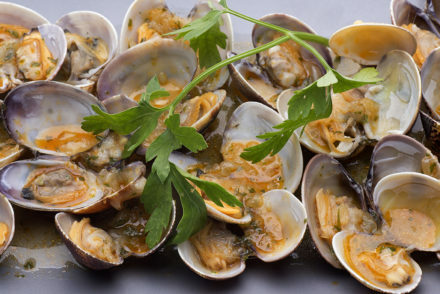 This recipe is not only creative and delicious, but it is also extremely easy to prepare. 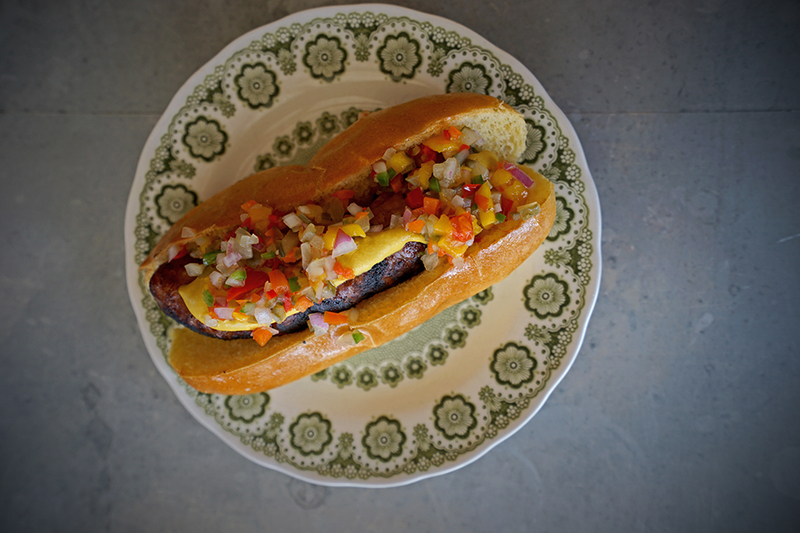 I enjoy brats with relish, onions and mustard and not much else. 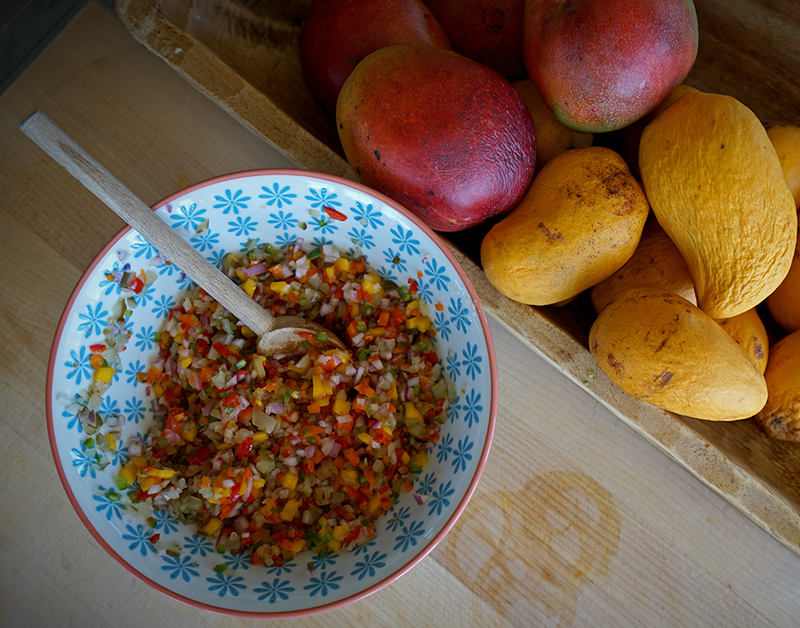 The day prior to the BBQ I had this vision of adding mangoes to my pickle relish. 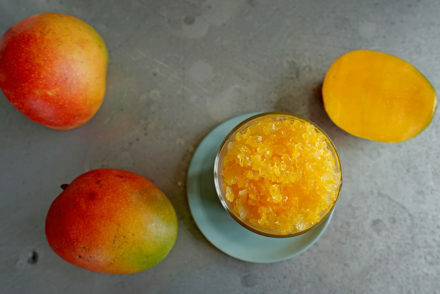 I sat with the idea for a bit, wondering if I’d finally crossed some sort of mango food pairing line with this idea, or if possibly I was a kitchen genius. Of course I Googled it and came up with just a few links of other food bloggers, mostly using pickled mangoes and a few recipes that seemed totally gross. But I was determined that my idea was more “genius” and less “she’s off her rockers”. So, I went with it, I laid out my idea, making sure I kept it simple. I knew simple was the only way it would work and ultimately the only way I fancied my brats. I incorporated all the things I love on my brats and dogs in one perfect condiment; onions, pickles, peppers, jalapeños; all encircled in a sweet vinegar flavoring that wasn’t too strong nor too sweet. I was definitely more kitchen genius on this mango pairing idea, the result is what I promise you will be bringing to the BBQ this summer! Try it. 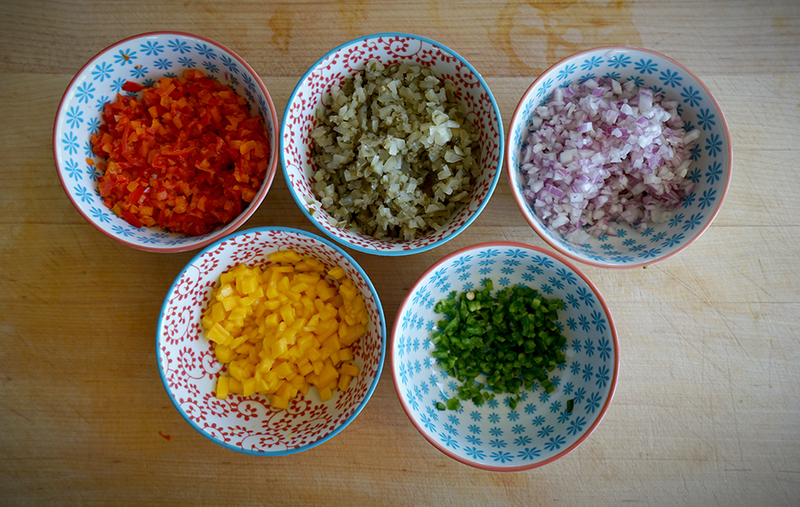 Make sure all the ingredients are chopped fine and uniform, this will contribute to an optimal texture and consistency, which is very important in a relish. 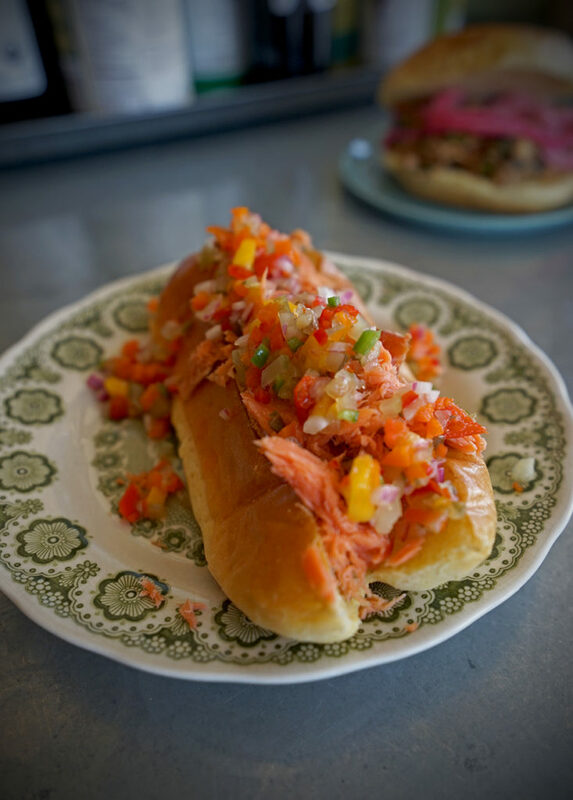 If you have pescatarian friends, its excellent with smoked salmon on a bun! Whisk together the sugar; salt and a small mixing bowl until all the sugar dissolves. Add the remaining ingredients and gently mix until all of the items are comingled nicely. Let the relish set for at least 30 minutes at room temperature. You can toss it in the refrigerator after if you like your relish cold. *You can find the pickled cherry peppers on the fresh olive bar of most retail grocery stores or you can find them bottled near the olives.